Citation: Simard, S., Laberge, S., Dusseault, M. Empowerment revisited: How social work integrated into a sports programme can make a difference. Journal of Sport for Development. 2014;2(3). Team sports may represent an arena in which adolescent girls can develop skills and abilities to gain control over their lives. The aim of this retrospective study was to explore how participation in a psychosocial programme using sport as an intervention tool could foster the process of empowerment in young women at risk of delinquency and school dropout. Interviews were conducted with seven young women who were involved in the programme during high school. A descriptive content analysis suggests that involvement in the programme may contribute to the participants’ empowerment process through better academic persistency, capacity to resist negative external influences and the development of life skills. Results, however, indicate that the empowerment process is moderated by the participants’ differential social environment and life trajectory after high school. Only one empirical study has drawn attention to the specific processes involved in girls’ empowerment in industrialized societies.12 The authors examined the empowerment process at work through sports involvement in women college athletes in the United States. However, to our knowledge, no study has focused on this issue in the case of high school girls at risk of delinquency and school dropout. Our current investigation is part of a larger research project that evaluates the impact of a psychosocial intervention programme that uses a team sport to reach at-risk youth. This innovative programme, called Bien dans mes Baskets (BdmB), promotes the psychosocial development of youth from less affluent backgrounds through their involvement in basketball. A detailed description of the characteristics of the programme is presented in the next section. This study aims to add to the body of knowledge regarding the role sports can play in empowering girls from underserved communities in industrialized societies. Moreover, we attempt to highlight the potential contribution of the combination of social work and sport in the empowerment process. BdmB is an innovative approach to social work that is more akin to “plus sport programmes” than traditional sports programmes. The “plus sports programmes” has been defined by Coalter13 as “programs that focus primarily on achieving nonsport objectives […] while incorporating sport as a component of their programming”. Accordingly, BdmB is characterized by a distinctive philosophy and specific youth development objectives. In the BdmB programme, sport represents an intervention tool enabling the social-worker-coach to reach those at-risk youth who would be difficult to reach in the more traditional context of an office meeting. Sport, therefore, becomes a means to reach these youth and promote their personal and social development. A feature of this philosophy is the use of the young people’s basketball-related dreams as a source of motivation to pursue further studies in the school circuit (vs. the civil circuit) since this is the preferred option to reach a high basketball level in Québec. It is this particular aspect of the programme’s philosophy that motivated the programme instigator to use the term athlete-student instead of student-athlete, which is the more common term in the scientific literature. The main objectives of the programme are to prevent school dropout, delinquency and social exclusion. In order to achieve these objectives, BdmB specifically targets the development of prosocial behaviour and life skills in athlete-students by exposing them to significant experiences in a sport context. BdmB targets students with an interest in playing basketball. However, in order to be part of the programme, students need to commit themselves to the programme philosophy. Upon acceptance into the programme, participants therefore commit in writing to abide by the programme rules and philosophy. Priority is given to students displaying behavioural problems, although students without behaviour problems are also eligible for the programme. The main issues found among girl participants pertain to prostitution and street gangs. During adolescence, young women from this neighbourhood are often confronted with difficult choices such as whether to continue their studies or take on paid work. Their family’s precarious financial situation and a lack of overall social support are major factors that can incite some teenagers to become involved in illicit activities such as prostitution. From the start of the programme in 1999–2000 until the end of the 2007–2008 school year (one year prior to data collection), approximately fifteen girls took part in the programme. Throughout that period there was only one female team (between 7 and 14 players) who went through their entire secondary school years together. The sports component of the programme (over the period of time the participants were in the programme) was comprised of several basketball-focused activities: two or three practices each week; free practice in the school gym during lunch hour, in the morning and on school holidays; about twenty games each season (the actual number depended on the team’s performance); and tournaments (between three and seven each year) held in Montreal and other cities. With respect to education, the programme offered the athlete-students academic support, which consisted of help with homework alongside encouraging them to take responsibility for their own educational experience so that they could develop independence. Two scholarships aimed at student retention were also available to those completing the programme in order to help cover post-secondary education costs. The programme also included community volunteer initiatives designed to encourage the athlete-students to pursue volunteer activities in their community. A few examples of the volunteer work done by young people in the programme include collecting and distributing food to the neighbourhood’s poorest families at Christmas, taking part in organizing and carrying out fundraising activities (e.g. tournaments between the programme’s young men’s team and city police), and becoming involved in basketball games and tournaments held at the school. It should be noted that all programme activities were open to both girls and boys. The psychosocial interventions, however, were gender specific. The social workers acting as coaches were, and still currently are, fully dedicated to the programme. They are not school employees but rather social workers from the public health department who work full time in this specific school. The programme is their strategy to get in touch with at-risk youth and intervene as social workers. They are available within the school during the day, but can also be reached evenings and week-ends if necessary. Girls who participated in this study had been supervised by two female social-worker-coaches who had academic backgrounds that enable them to be sensitive of gender in their interventions. The social-worker-coaches use actual events experienced by the students in the context of the team as well as in other areas of their lives to trigger social group work interventions. In this way, the team and team-related events provide the raw material for the intervention. This method thus differs from the one used by most youth development sports programmes such as First Tee Life Skills Program 17 and SUPER Program 18, which consist of predetermined workshops targeting different life skills such as honesty and respect. In the BdmB programme, the social-worker-coach uses real lived experiences and group dynamics to foster reflections and develop a critical mind. Contrary to many programmes targeting positive youth development, which run for a predetermined amount of time of several weeks to several months, students can participate in BdmB at any time during high school, which lasts a maximum of five years. The duration of programme participation can thus vary considerably. The number of years during which the participants of the current study participated in the programme is provided in Table 1. There is no specific follow-up to the programme. When participants leave the high school they leave the programme. However, it is always possible for them to stay in contact with the social-worker-coaches. In this study, we examine more specifically the empowerment process at the individual level within girls from underserved communities. The aim is to highlight the elements or factors that may contribute to the development of a personal feeling of increased power or control over one’s life without changing the dominant social structure. 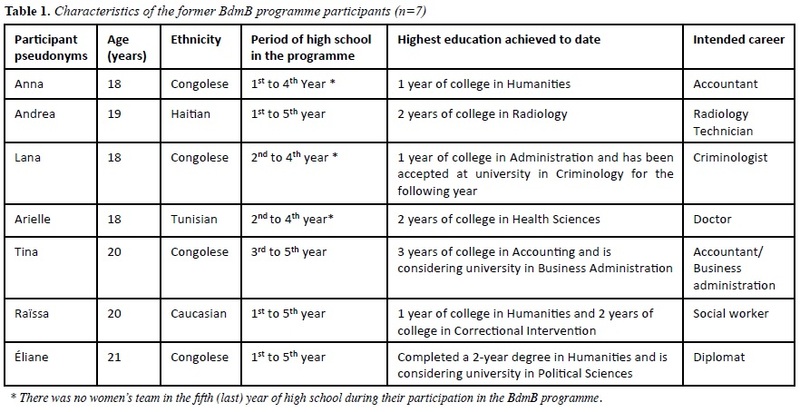 Semi-structured interviews were carried out with seven young female adults (mean age = 19 years) who were involved in the BdmB programme between 2003 and 2008 and had left the programme at least one year before the beginning of the study. Table 1 presents some characteristics of the former BdmB participants who were interviewed. Convenience30,31 and snowball31 sampling were used as part of this research. No other method could be applied given the major constraints of the context, namely the young women’s distrust in regard to participating in discussions with strangers and the rather limited number of participants of about fifteen young women in BdmB between 1999 and 2009. We thus requested the cooperation of the coordinator and some coaches to contact past-participants. It is important to note that certain coaches made the decision not to put us in touch with certain participants in difficult situations (prostitution, street gangs) to avoid unintended effects the interviews might have on them if they agreed to participate in the study. This may have contributed to restricting the number of study participants. We also requested the cooperation of past-participants who had agreed to meet with us. They helped us contact other past-participants. Our sample thus shares convenience and snowball sample characteristics and is not representative of the study population, namely all past-participants of the BdmB programme. Face-to-face interviews were conducted at venues chosen by the participants. In general, interviews lasted about one hour and were recorded with their consent. The interviewer was a 34-year old, Caucasian graduate student who had previously received training in qualitative methodology and interview techniques. This qualitative study adopts certain elements of constructivist grounded theory.33 We adopted this approach particularly to promote openness and the potential emergence of a theoretical framework through the analysis of data rather than applying an existing framework to the data.34 In order to proceed to the thematic content analysis, we carried out a two-stage coding process. First, we conducted an open coding of data. The codes were created in reference to the themes that emerged from the testimonies rather than from existing theories. Then, categories regrouping codes of similar content and relevant to the research question were created. Initially, we performed a vertical analysis (i.e., an internal analysis of each interview). Subsequently, a transversal analysis (i.e., an analysis between interviews) was conducted, which highlighted recurring themes. From such analyses emerged a conceptual framework that aimed to report the empowerment development process. Word frequencies were not considered in our analysis because in this type of qualitative methodology, the number of times an expression is used is not considered indicative of its salience. Even an expression mentioned once can be of importance, depending on its context in the interview. The coding process was carried out by two investigators separately. In the rare instances of discrepancies in interpretation, consensus was reached through discussion. Another key characteristic of our approach is its retrospective nature based on interpretive interactionism.35 In this approach, it is assumed that if someone defines a situation as real, it is therefore real in its consequences. This implies that people’s subjective recollections of events have important implications for their ongoing self-story. Thus, the accuracy of how people recall an event is less important than how they perceive the consequences of the event in their biographical experience. This approach, previously used by Holt and colleagues,36 seems promising for understanding the key elements of the empowerment process in a sports context. Like Holt and colleagues,36 we were not concerned with the objective accuracy of the recalled events, but rather with how these events were perceived and interpreted within the participant’s life.36 Consequently, it is through the subjective recollections of the participants’ experiences in the BdmB programme that we look at the empowerment process. The conceptual framework that emerges from the data analysis allows for an overview of the various factors that impacted the development of empowerment in the study participants (Figure 1). Their testimonies suggest that involvement in the BdmB programme contributed in different ways and at varying intensities to the development of empowerment, especially by enhancing their perception of control over their lives. This improvement was most likely the result of cumulative learning experiences including the capacity to resist negative external influences and the development of life skills combined with various positive life experiences. Moreover, the participants’ testimonies suggest that the development of various life skills, and their transfer from sports to other contexts in life, has contributed to a gain in control over their lives. The positive experiences they had in participating in the programme were also beneficial to their academic aspirations and persistence, and to their capacity to make the “right” choices. However, the life trajectory of participants following programme involvement was quite diverse. These differences appeared to have modulated the impact of the programme on their gain of control over their lives. The next section discusses the key elements of the empowerment process presented in Figure 1. When we play basketball, we know the others who play in the other schools and it’s totally different there. Here, we have a programme for basketball but at the same time we focus on social stuff, on us. Black girls that I knew, that played basketball in other schools, they all quit school, they started dancing, just like that. School was never their priority. At our school, we learned at basketball that the game isn’t over until it’s over, so you have to give 100% until you get what you set out for. Other teams, the coaches, well all you have to do is win the game, that’s it. This is consistent with the work of Collins, Gould, Lauer and Chung,37 who stated that it is imperative that the coaches assign primary importance to the development of their players as good citizens. In the end, I decided to quit my job. The thing was that I missed basketball and because, if I work, then I make all this money and then I think that I don’t even have to go to school. But if I play basketball with the others, I get support to stay in school. 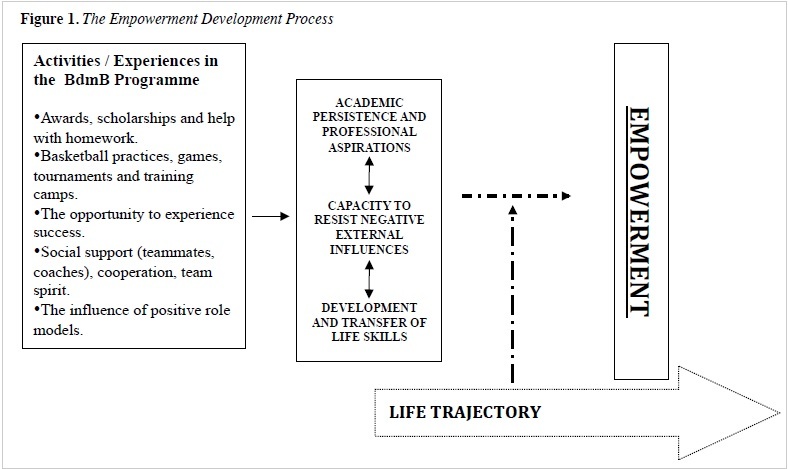 This is consistent with the results of Daud and Carruthers38 who mentioned that the two most important aspects of extracurricular high school activities that encourage youth to think about their future in terms of obtaining academic knowledge are: 1) good communication between players and coaches and 2) programme focus on the development of life skills. This is consistent with other findings where coaches are reported to act as role models for the youth with whom they interact.39,40 Participation in these types of programmes may put these adolescents in touch with significant others who deal successfully with challenges in their own lives. These significant others can serve as hook-ups to experiences and opportunities that provide young people with exposure to possible positive futures.41 This can be particularly relevant in the case of women coaching girls as females are more likely than males to emulate and identify with a matched-gender role model, and the success and visibility of the female may have a positive impact on girl’s motivation, self-confidence and self-perception.42,43 As suggested by Audas and Willms,44 a correlation exists in boys and girls between dropout rates and rates of delinquency, teen pregnancy and drug use. It can be assumed that engaging in this type of negative life trajectory can contribute to the perception of limited control over one’s life and the reproduction of social inequalities especially for young women. Conversely, being confident, competitive, and having a high level of education is recognised as an asset for girls and women in developing a perception of increased control over their lives.45 The BdmB programme appeared to have contributed to the empowerment process of the participant through positive socialisation, and by offering participants new life possibilities and opportunities with regard to their academic future. The coach’s positive reinforcement, encouragement and support played a key role in this process. However, in light of our results, it is important not to disregard the influence of the living environment on the life trajectory. For example, college education was much more difficult to achieve for some participants because of personal and family situations (for example, an unplanned pregnancy or a parent losing her/his job). These situations may require the interruption of education for a period of time to work full time and provide for oneself and one’s family. This illustrates the importance of understanding empowerment as a dynamic process that is in constant interaction with the environment.27 It is also important to mention that the effect of the programme on the participants’ academic persistence was of greater importance when the parents’ support was not present. Indeed, in the case where parents do not encourage their child to persevere at school, the programme may have a greater determining role than when the participants’ parents offer support and guidance. A second main theme emerging from our content analysis which seemed to contribute to the empowerment process is the capacity to resist negative external influences. It appears that participation in the BdmB programme has helped participants, to varying degrees, to be in greater control and to make better decisions in vulnerable situations (negative external influences). Analysis of participants’ accounts suggested that three main factors appeared to have played a role: 1) valorisation gained through the programme; 2) a protective factor of the programme; 3) the psychosocial development aspect of the programme. Basketball especially helped me not to hang out with street gangs and not to take drugs. When you start off well in life, you have more chances to stay on the right path, even if there’s always a chance that you might fall off the wagon at some point. It helped to stay far from people like that, because you just can’t do both. It looks like either you’re in a gang, or you’re in basketball. Because all the way from the first to the last year of high school, we were supervised for academics, and you get involved in the programme, and you practice with the others, so it’s, like, impossible to be in a gang. This suggests that participants were more inclined to socialise with other BdmB players than other adolescents who could have had negative influences on them. These results are similar to those of Daud and Carruthers38 where adolescents from less affluent backgrounds participated in after-school activities, preventing them from associating with problem groups. It seems, therefore, that the coach’s expertise as a social worker and her daily presence in the school played an instrumental role in the participants’ development. The positive influence was particularly mediated by her concern for the participants’ psychosocial development (more so than their sports performance) and her daily presence in the school and neighbourhood. This is consistent with the results of Petitpas, Cornelius, Van Raalte and Jones46 who suggested that the quantity and quality of the interaction between the athlete and her/his coach is one of the best indicators of the resulting effect that the programme will have on the psychosocial development of the adolescent through sports. Furthermore, Camiré, Trudel and Lemyre47 mentioned that one of the most important factors that promote the development of closer ties between coaches and youth is the coach’s daily presence within the school. This situation was found to favour the relationship between participants and the coach compared with the situation where the coach is only present during practices and games. It was so tempting, so tempting to go dancing. Even today I don’t really want to because it’s a bit degrading, but sometimes I check it out. It happened once when I had no milk for my son, we had just moved into a bigger apartment, and it was tough on the wallet. So I thought I could go dancing. I thought about it. But all what I learned in the past told me that it wouldn’t serve me in the long run. It wouldn’t do me any good. The analysis of our data suggests that the BdmB programme favoured the development of various life skills among participants in varying degrees of importance. Of these skills, we noted stress management, problem solving, emotional control, punctuality, time management, organisational skills, work ethic, responsibility, communication, leadership, teamwork, and respect for others. Most importantly, some of the skills developed through participation in the BdmB programme seem to have been transferred to contexts other than sports, both during the programme (to school tasks, friends and family) and following the programme. While we recognise the possible role of several skills, two of them appear to be more closely related to the process of empowerment: 1) the ability to set goals and establish strategies to achieve them, and 2) the ability to see challenges as opportunities rather than obstacles. Concerning the first skill, the competitive nature of basketball combined with the strategies implemented by the social-worker-coach may have played a critical role. For example, at the beginning of each season, the social-worker-coach requested that the team as well as each participant set goals. Then, individually and in groups, participants were expected to develop strategies to achieve them. This type of intervention may have allowed participants to transfer these skills to other life situations. One of the participants, who was then in early adulthood, always kept the habit of setting goals as she had done at basketball practice. She often notes her life objectives and strategies in a notebook. Basketball gave me lots of confidence, it helped me to work on who I am, to believe in myself because I know I can. But there are other things in life that make me not believe in myself. Like my relationship with my mom. Because it’s so bad, and because she never congratulates me, it decreases my confidence, a lot. I don’t know why, but it’s important for me that my mom congratulate me. I have to hear her say it. But she won’t, so it affects my confidence in myself. When things aren’t going well, I remember basketball days. I remember those years and that I was able to do things. That means I can still do them today. There are some limitations to this study that warrant consideration. First, we were not able to reach all former BdmB participants. Therefore, the factors involved in the empowerment development processes identified through our relatively small sample may not be exhaustive. Second, it is possible that participants were hesitant to express negative thoughts about the programme, even in confidentiality. Moreover, social desirability may have influenced participants’ responses. The aim of this study was to explore how participation in a psychosocial programme using sport as an intervention tool could foster the process of empowerment in young women at risk of delinquency and school dropout. While various research studies8-12 have looked at sports as a context favouring empowerment, no study to our knowledge has focused particularly on a programme combining psychosocial intervention and sport as a means of empowering young women. Three main contributions stand out in this study. First of all, the study was able to identify two life skills that appear to play a key role in the empowerment process: the ability to develop the means of achieving stated goals and the perseverance to actually do so. These skills enabled participants to experience success in both a sports and an academic context and to acquire a better sense of personal competence. The second contribution is that our study highlighted the critical role that the experiences lived in the programme play in the participants’ capacity to resist negative external influences. The acquisition of a sense of personal competence and the capacity to resist negative external influences are in some way interconnected: the experience of success in sports and in the academic arena (persistence), enabled participants to consider the possibility of a future other than the one fraught with risks that otherwise lay before them. The last main contribution of our study is that it highlighted the notion that empowerment is a dynamic process in constant interaction with the environment and an individual’s life trajectory. To our knowledge, no previous study has accounted for the dynamic interaction between the empowerment experienced in sports and the life trajectory of young women. Accordingly, empowerment should not be considered as something that is acquired forever but rather as something that is always being challenged. To deepen our understanding of the role of the social worker on the empowerment process, studies that could account for their specific strategies of interventions within sport-based psychosocial programme are needed. This might provide promising insights for social workers using sports to intervene with adolescent girls and favour their empowerment. This study was supported by a grant from the Lucie and André Chagnon Foundation and the Jeanne-Mance Center for Health and Social Services Foundation. We would like to thank the staff of the Jeanne-Mance high school for their generous contribution of time and support to this project. We are particularly indebted to the young women who participated in this study. Brady Laying foundation for girls’ healthy futures: Can sports play a role? Studies in Family Planning. 1998; 29(1):78-82. Jacobs Lehman S, Silverberg Koerner Adolescent women’s sports involvement and sexual behavior/health: A process-level investigation. Journal of Youth and Adolescence. 2004; 33(5):443-455. Autry Adventure therapy with girls at-risk: Responses to outdoor experiential activities. Therapeutic Recreation Journal. 2001; 35(4):289-306. Leedy G. I can’t cry and run at the same time: Women’s use of distance running. Journal of Women and Social Work. 2009; 24(1):80-93. Chrisler JC, Lamont JM. Can exercise contribute to the goals of feminist therapy? Women and Therapy. 2002; 25:9-22. Blinde EM, Taub DE, Han L. Sport participation and women’s personal empowerment: Experiences of the college athlete. Journal of Sport and Social Issues. 1993; 17:47-60. Coalter, F. Sport-in-development: Accountability or development? In Levermore R & Beacom A, editors. Sport and International Development. Hampshire, UK: Palgrave Macmillan; 2009. p. 55-75. Lindsay J. Le service social des groupes: concepts et pratique. In Deslauriers JP & Hurtubise Y, editors. Introduction au travail social. Sainte-Foy, Québec : Presses de l’Université Laval; 2007. p. 169-192. Middleman RR, Wood G. From social group work to social work with group. Social Work with Groups 1990; 13(3): 3-20. Rappaport Studies in empowerment: Introduction to the issues. Prevention in Human Services. 1984; 3:1-17. Gibson CH. A concept analysis of empowerment. Journal of Advanced Nursing. 1991; 16:354-361. McWhirter EH. Empowerment in counseling. Journal of Counseling & Development. 1991; 69:222-227. Pouliot Les indicateurs de l’empowerment pour évaluer l’impact d’un programme de développement par le sport au Kenya. (Unpublished master dissertation). Université Laval, Canada; 2007. Rowlands Empowerment examined. Development in Practice. 1995; 5(2):101-107. Gutierrez Working with women of color: An empowerment perspective. Social Work. 1990; 35:149-153. Creswell Qualitative Inquiry and Research Design: Choosing among Five Approaches. Thousand Oaks: Sage; 2007. Patton Qualitative Evaluation and Research Methods. Newbury Park, CA: Sage; 2002. Saldana The Coding Manual for Qualitative Researchers. Thousand Oaks, California: Sage Publications; 2009. Charmaz Grounded theory: Objectivist and constructivist methods. In Denzin N & Lincoln L, editors. Handbook of Qualitative Research. Thousand Oaks: Sage; 2000. p. 509-535. Denzin NK. Interpretive Interactionism. London: Sage; 2001. Holt NL, Tamminen KA, Tink LN, Black DE. An interpretive analysis of life skills associated with sport participation. Qualitative Research in Sport and Exercise. 2009; 1(2):160–175. Collins K, Gould D, Lauer L, Chung Y. Coaching life skills through football: Philosophical beliefs of outstanding high school football coaches. International Journal of Coaching Science. 2009; 3:29-54. Daud R, Carruthers Outcome study of an after-school program for youth in a high-risk environment. Journal of Park and Recreation Administration. 2008; 26(2):95-114. Martinek TJ, Hellison Fostering resiliency in underserved youth through physical activity. Quest. 1997; 49(1):34–49. Nichols A consideration of why active participation in sport and leisure might reduce criminal behaviour. Sport, Education and Society. 1997; 2(2):181–90. Coakley, J. Using sports to control deviance and violence among youths. In Gatz, M, Messner MA, Ball-Rokeach SJ, editors. Paradoxes of Youth and Sport. NY: Suny Press; 2002. p. 13-30. Fasting K, Pfister Female and male coaches in the eyes of female elite soccer players. European Physical Education Review. 2000; 6(1): 91-110. McCharles Female varsity athletes’ perception of how coaches influence their self-confidence (Unpublished master dissertation).University of Ottawa, Ottawa, Canada; 2003. Perry-Burney GD, Baffour Kwaku Self Esteem, academic achievement, and moral development among adolescent girls. Journal of Human Behavior in the Social Environment. 2002; 5(2):15-27. Petitpas AJ, Cornelius AE, Van Raalte JL, Jones T. A framework for planning youth sport programs that foster psychosocial development. The Sport Psychologist. 2005; 19:63-80. Camiré M, Trudel P, Lemyre Profile of school sport coaches and their coaching philosophy. Phenex Journal. 2011; 3(1):1-14. Farley M. Prostitution and the invisibility of harm. Women & Therapy. 2003; 26(3/4):247-280. Miller Gender and victimization risk among young women in gangs. Journal of Research in Crime and Delinquency. 1998; 35(4):429-453. Danish SJ, Taylor TE, Fazio RJ. Enhancing adolescent development through sports and leisure. In Adams GR, Berzonsky MD, editors. Blackwell Handbook of Adolescence, Malden, MA: Blackwell; 2003. p. 92-108. Danish S, Taylor T, Hodge K, Heke Enhancing youth development through sport. World Leisure Journal. 2004; 46(3):38-49. Gould D, Carson S. Life skills development through sport: Current status and future directions. International Review of Sport and Exercise Psychology. 2008; 1(1):58-78. Deem R, Gilroy S. Physical activity, life-long learning and empowerment. Sport, Education and Society. 1998; 3(1):89-104.